This fish should be kept as a pair. To smaller fishes of their own kind they are rather aggressive and during breeding time they are aggressive to all fishes. In breeding time they dig a lot in the substrate and plants are demolished. They aquarium should be set up with driftwood, roots and stones. The substrate should be sandy. Breeding is easy. 100 - 500 eggs are laid and fertilized on a stone. When the eggs hatch the parents remove the fry to a breeding pit. Both parents care for the fry. You can raise them with baby brine shrimp. 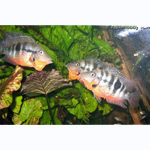 Neotropical Cichlids such as the Green Terror, Green Severum, Gold Severum, Salvini, Texas and Blood Parrot. Also Plecos.